UPDATE: Due to a significant increase in traffic, you may experience delays with the Flood Risk Tool. If so, please use the Static Flood Risk Map (PDF) linked below. 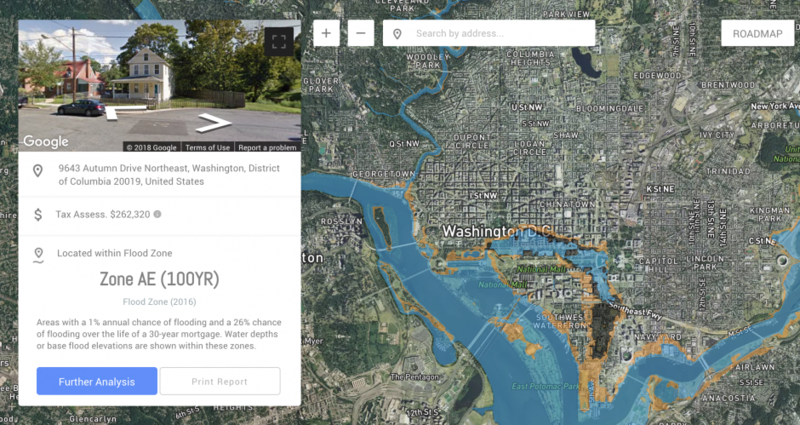 The purpose of the DC Flood Risk Tool is to help design professionals, developers, and consultants identify the potential flood impacts of a particular site. The tool offers an interactive map that offers views of the risks of multiple types of flooding throughout the District. The map includes layers of FEMA Flood Insurance Rate Maps (FIRMs), storm surge, and sea level rise. The tool will automatically identify the FEMA flood zone based on the latest FEMA mapping.